Line F in New York's subway (the Culver line, Part of the Brooklyn/­Queens Crosstown line, the 6th Avenue line, and a part of the Queens Boulevard line, all except for the Culver line former IND, the Culver line former BMT), for the class R-46 subway train. 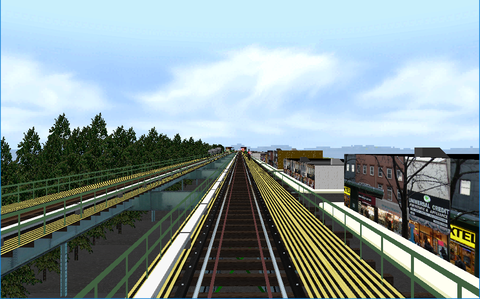 The line goes from Coney Island in Brooklyn via Manhattan to Jamaica - 179th Street in Queens. There are no less than 36 alternatives (!) to drive the whole or parts of the line. The alternative data below is for an average alternative all the way. There are more objects to download for this line than are included in the route's archive file. All archives listed in the "Download from"-section below are needed to get this route to display the graphics properly. There is also an object package NYCTCommon that is neither included nor available as separate download. It is however included in the V line package. Download and install the V line also to get it. Route, object and sound files at BVEstation, 6th Avenue Objects at BVEstation, 8th Avenue Objects at BVEstation, V line at BVEstation, from which to get the NYCTCommon object directory.